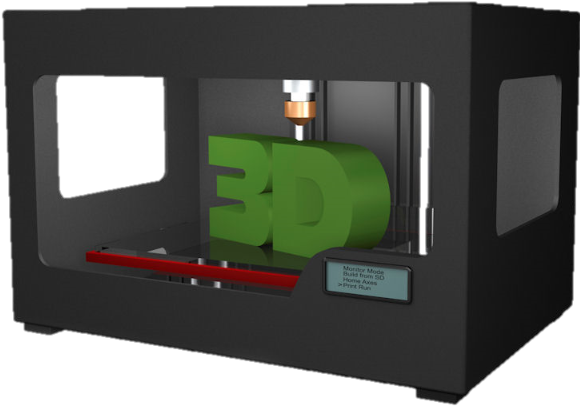 3D printing is a generic term for a number of technologies that encompass the additive manufacturing world. Additive manufacturing is a process where a digital file is converted into a solid product by building the image in a series of layers of material. There are four basic categories for this technology and each has its own uses and applications. FDM is an extrusion method of additive manufacturing. It is basically like a hot glue gun, melting material provided on a spool and applying it to specific locations in very small drops to achieve a physical build. Pros: The resolutions on these machines have improved dramatically in the past 2 years. The materials options are expanding quickly because of the volumes possible with the home/hobbyist market. This is also the easiest technology to manipulate and so allows materials developers to experiment more quickly (no cartridges to redesign). The cost of producing on these machines is substantially lower than the other technologies, making FDM the ideal technology for draft prototype production. Material options include brick-like and wood-like and ceramic materials. Cons: These machines tend to be slower. Although there is a variety of materials to work with, most fall within the plastics category, limiting the true variability of materials. The machines typically are only able to print from one spool of material at a time (in addition to the support material). This limits the ability to do color. Tends to be slower for production. Stereolithography (SLA), utilizes a resin material that is cured using ultraviolet light. The print heads in these machines along with the liquid base materials are what drive the accuracy levels (it’s easier to be more accurate with something the size of a grain of sand rather than a bowling ball). Speed is driven mostly by the number of layers applied, rather than the build base. Pros: The liquid materials allow for the creation of products that use multiple materials simultaneously and even the blending of resins before application. Fast production speeds. The resin materials available include a range of medical-specific materials, ready for autoclaving. The ability to produce organic geometries is also enhanced with the liquid materials. Resin allows for smoother edges and reduces finishing time. Cons: More expensive than FDM for the equipment and supplies. SLS uses a laser to heat materials that are in powder form to selectively build materials. Pros: Material options are broad, including metals, sandstone, ceramic, and others. Highly precise process. Accuracy is based on the powder size. Production speeds are good. Powders allow for reuse of materials, with the ability to recapture of almost all unused powder, for reduced waste. The powder allows for smooth finishes. Because the powder, itself, acts as the support material, no post-processing is necessary to remove supports. Cons: More expensive than FDM for the equipment and supplies. Non-metal powder that is recaptured may suffer from degradation to due to heating process. Although there is software to correct for this, SLS may leave voids and some variation in density in the finished product. An electron beam is used to heat materials, also in a powder form. Very similar to SLS technology, but uses an electron beam instead of a laser for heating powders. Pros: Highly accurate and controllable. Unlike some metal sintering techniques, the parts are fully dense, void-free, and extremely strong. Otherwise, very similar to SLS.